Tart cherry juice is a flavor-rich ingredient for cocktails. Photo by Liv Friis-Larsen | IST. 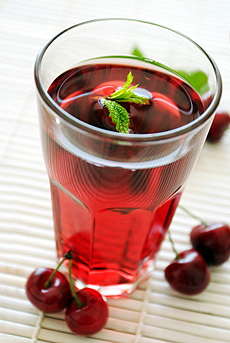 One of the healthiest juices you can drink is tart cherry juice. Sometimes called a superfruit,* tart cherries (also called sour cherries and Morello cherries) have among the highest levels of disease-fighting antioxidants, as compared to other fruits. They also contain other important nutrients such as beta carotene (19 times more than blueberries or strawberries), fiber, folate, iron, magnesium, potassium and vitamins C and E. A growing body of scientific research links cherries to health benefits, from helping to ease the pain of arthritis and gout, to reducing risk factors for heart disease, diabetes and certain cancers. Cherries also have been found to help regulate the body’s circadian rhythm, prevent memory loss and delay the aging process. You can read more about the fruit at the website of the Cherry Marketing Institute, ChooseCherries.com. *A superfruit is one that has a high antioxidant level as well as nutritional density. Others include açaí, blueberry, cranberry, grape, guarana, mangosteen, noni and pomegranate. Most of us are acquainted with the fun side of cherries: cherry pie, ice cream, yogurt and other delights. Now consider the cherry cocktail. These bright red cocktails are also perfect for red-themed holidays like Independence Day, Christmas and Valentine’s Day. Find recipes for a Cherry Red Eye Mojito and Red Alert Cherry-Coconut Fusion on TheNibble.com.